Countless eons ago, having made many offerings, Maitreya took bodhisattva vows from the Tathagata Great Power in front of many other buddhas. From that moment on he has led countless sentient beings to enlightenment, guiding them along the path of the three higher trainings of discipline, concentration and wisdom by means of the three vehicles: Shravakayana, Pratyekabuddhayana and Mahayana. While practicing as a bodhisattva he specialized in the meditation on great love. He not only taught this path to others but also meditated upon it continuously himself, often stationing himself at the gate of a city and contemplating deeply on loving kindness. His meditation was so powerful that people passing by close enough to touch his feet would themselves receive the realization of great love. This greatly pleased the tathagatas of the ten directions, who rejoiced in his actions and predicted that in all his future lives as a bodhisattva and a buddha he would be known as “Love” [Skt: Maitreya; Tib: Jampa]. This is how he received his name. In one of those lifetimes Maitreya was born as one of the thousand sons of a great king. This king wanted to know in which order his sons would become enlightened, so he put all their names into a bowl, meditated deeply for seven days while performing many ritual offerings, and then drew the names out of the bowl one by one. Maitreya’s name came out fifth, and the buddha of that age, the Tathagata Limitless Knowledge, predicted that Maitreya would be the fifth buddha of the present era, Shakyamuni being the fourth. Eventually Maitreya advanced through all the levels of spiritual development, achieved the tenth and highest level of a bodhisattva, and afterwards became a fully enlightened buddha. Having reached this level of utmost perfection, he manifested in many different aspects in countless buddha fields; at present his particular abode is the pure land of Tushita, where he imparts Mahayana teachings to countless advanced bodhisattva disciples. It was here that he taught his five famous texts to the great Arya Asanga. Maitreya also gives many other teachings, in accordance with the needs of different disciples. He appears as countless spiritual masters throughout the ten directions of space, thereby leading innumerable beings along the path to full awakening. In the future, because of the growth of delusion, the beings in this world will degenerate – their lifespan will decrease and their lives will be filled with much suffering. When human life expectancy has decreased to only ten years, Maitreya will manifest in the form of a great spiritual leader and demonstrate the path of virtue. In particular, he will spread the teachings on loving kindness and, as a result, the fortune of the humans in this world will begin to improve – they will gradually give up their deluded attitudes and harmful behavior and their lifespan will start to increase. After many eons it will have grown enormously and people will live for 80,000 years. Then their lifespan will slowly decrease again until it reaches about one hundred. According to the prophesies of all the buddhas and his own promise, this is when Maitreya Buddha will appear in the world as a universal teacher, or founding buddha, like Shakyamuni. His father will be King Great Compassionate Brahmin and his mother Queen Youthful-Looking One. Maitreya will be born from her side as she stands in a forest garden and the great celestial king Indra will receive the newborn buddha with great devotion. Immediately the baby Maitreya will take seven steps in each of the four cardinal directions and on each spot that he places his feet a treasure of lotuses will bloom. He will then declare, “I am the unsurpassed savior of the world and have come to liberate all beings from suffering. This will be my last rebirth; there will be no further reincarnations for me.” Upon hearing this, all the exalted beings and spirits of the world will rejoice, perform many acts of purification and present him with magnificent offerings. His proud father will then take him around the city so that the citizens can also rejoice at their new treasure. Beautiful goddesses will offer him flowers and the great sages will predict that in that very life he will become a fully enlightened buddha. Thereafter he will follow the life of a royal prince. When the time comes for him to be educated Maitreya will be the foremost of 4,080 students; when it is time to marry he will have many wives, with whom he will live for ten thousand years. Then a great religious festival of brahmins will take place in his kingdom, during which Maitreya will demonstrate that he has come to realize the impermanent nature of phenomena; seeing the example of the ascetic monks, he will declare his renunciation of cyclic existence and his intention to leave his royal surroundings and follow the religious way of life. This decision will so greatly shock those around him that the whole palace and all his wives will fly up into space. Having made this decision to abandon the royal way of life, Maitreya will depart into the forest. All the celestial beings and saints will rejoice at his resolve, offer prayers for his success and protect and care for him as he meditates. Following his example, many of his wives, 1,040 members of his retinue and numerous city dwellers will follow after him in great devotion and also take ordination as religious practitioners. For seven days Maitreya will follow the ascetic way of life, refraining from all food and drink. Then, upon arising from a state of deep meditative concentration, he will receive a bowl of milk from his wife Dawa’i Tongchen. Refreshed, he will assume the vajra crossed-legged posture and make the firm determination not to rise from meditation until he has achieved enlightenment. That evening he will defeat all demonic interferences and negative forces (Mara) and in the middle of the night will enter a state of profound meditative absorption. Finally, with the rising sun the following morning, Maitreya – who in fact achieved full enlightenment many eons before – will demonstrate for the sake of his fortunate disciples the attainment of complete and perfect buddhahood. Then, in the same manner as all the buddhas of the past, present and future, he will lead countless beings out of suffering and along the path to full spiritual awakening. For seven weeks after his demonstration of enlightenment Maitreya will remain in silence, observing his future disciples. Then Indra, the king of the celestial beings, will present him with a golden wheel and the universally beautiful objects of the five senses and request him to turn the wheel of Dharma for the benefit of all. In response to this request Maitreya will teach the four noble truths, thereby leading many millions of disciples to liberation. During his long teaching career Maitreya will turn the wheel of great teachings three times and each time countless multitudes of disciples will come to listen. These teachings will be enormous events attracting not only human, Earth-born disciples but also many celestial beings, dakas, dakinis and beings from other realms, many of whom will immediately become arhats, bodhisattvas and even fully enlightened buddhas. Through the power of his holy body, speech and mind Maitreya will lead and satisfy all those gathered according to their individual needs and capacities, giving Hinayana teachings to some and Mahayana to others. In this way he will lead countless disciples through the three vehicles to liberation and enlightenment. Maitreya will remain for 60,000 years, providing direct spiritual guidance to his many disciples during his lifetime and, after he passes away, his teachings will last another 80,000 years, indirectly benefiting many more. Thus, through the power of his great, enlightened loving kindness, Maitreya will provide limitless benefit to countless mother sentient beings. In the absolute sense Maitreya is subject to neither death nor rebirth; he is forever benefiting all mother sentient beings. Furthermore, he once declared, “Anybody keeping just one vow of moral discipline purely during the time of Shakyamuni Buddha’s teachings will become my personal disciple when I appear and I shall liberate all such disciples,” and he faithfully keeps this promise, his sworn oath and pledge. Therefore, those of us fortunate enough to have met the teachings of Shakyamuni Buddha and maintained some level of pure discipline are guaranteed to make direct contact with Maitreya, become his disciple and quickly achieve enlightenment. 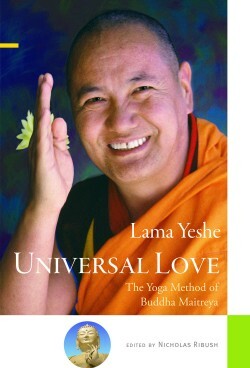 From Universal Love, this prologue was first published in the sadhana distributed by Maitreya Institute at the time Lama Yeshe gave this teaching in 1981.